Pushback Pallet Rack | Advanced Handling Equipment and Design Group, Ltd.
Pushback Rack Systems are designed to store pallets from two to as many as six units or pallet positions deep. 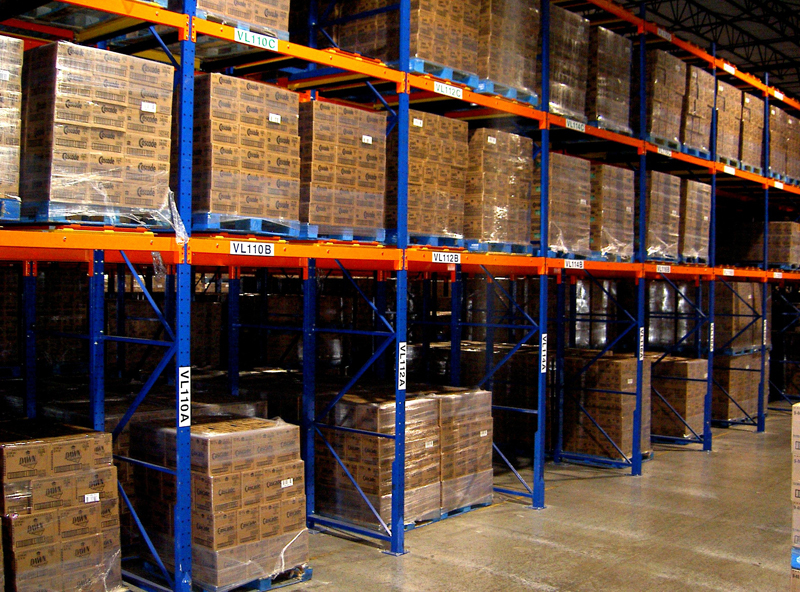 This greatly reduces the number of aisles needed in the storage area, which frees up valuable floor space for storage. Pushback systems can increase storage capacity by up to 90%. Maximizing the storage cube with pushback rack reduces handling and operating costs and product damage. Fewer aisles also means faster picking and stocking times. Pushback rack facilitates “last in, first out” inventory, which makes it an ideal solution where some items may have longer storage life or don’t require immediate access. Because it provides very compact storage, pushback rack is often used in freezers, coolers and other food storage facilities, as well as other storage applications where floor space is at a premium. Pushback rack utilizes a series of nested, color coded carts to store pallets. When a pallet is selected, the pallet behind it gently glides into position so it can be picked. Loading the system is also very easy, the pallet being loaded pushes the previous pallet, on its individual cart, back to reveal the next cart and make room for the new. Because this system is gravity operated, little or no equipment maintenance is required. With fewer picking faces, there is less collision damage from lift equipment. For the Best Design, the Best Equipment, and the Best Installation, contact Advanced Handling Equipment and Design Group, Ltd. TODAY at 404-753-1662 to find out how we can help increase storage capacity by maximizing the available storage cube with a pushback rack system.